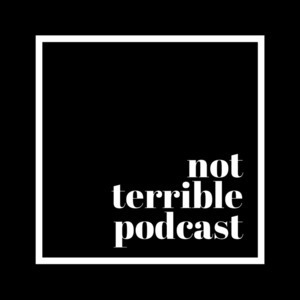 The Not Terrible Podcast is a field guide for the hopeless optimist in all of us. Jess and Mary recap their favorite episodes of season 4. They take questions and comments from listeners and tell you what's to come in season 5. On this episode, Jess and Mary are discussing this season's book club selection, Everything Happens For A Reason and Other Lies I've Loved by Kate Bowler. Bowler tells her journey of an early age cancer diagnosis and how she grapples with the reality of her situation. They share their thoughts and opinions on the book as well as listener reviews and comments. In episode 37, Jess and Mary are talking about growth and death. They share what they're letting go of during this season of their lives, and what they are working to become. Episode 36 finds Jess and Mary talking about addiction in romantic relationships. They share their personal stories and discuss the emotional, physical, and social effects of addiction. On episode 35, Jess and Mary are getting therapy advice from a real therapist. They're talking with Brooke Randolph, a licensed mental health counselor. Brooke helps Jess and Mary understand different therapy options, how to identify a good therapist, and what to do outside the therapist office to make the most of their mental health journey. Episode 34 finds Jess and Mary talking about seasonal affective disorder (SAD). They cover what it feels like, why it happens, and how to try to handle it. #33: What is EMDR therapy? In episode 33, Jess and Mary are discussing EMDR therapy: what it is, how it works, and what it's been like for Jess. On episode 32 of the Not Terrible podcast, Jess and Mary learn how to keep their kids safe online with the founder of the Child Rescue Network, Jeff Griesemer. Jeff shares his twenty-plus years of experience as he talks about keeping kids safe online, how to know when a child is being exploited, and how to address it. On this week's episode, we are continuing our discussion on minimalism and consumerism. We're talking about the people and the books reshaping the way we look at our possessions. Mary and Jess invite their kids on the podcast for a very special Christmas episode. The moms ask questions, and the kids give (too honest) answers. Merry Christmas and Happy New Year from the Not Terrible family to yours. On episode 29, we're preparing for the holiday season by discussing the less happy side of celebrating. The holidays aren't always joyful and sometimes they even exaggerate the everyday stress. We'll share ways to survive the next few months and why it's okay to not be excited about the season. #27: Unexpected Loss and Grief, Part Two with Paula E.
In episode 27, Mary shared her story of the unexpected loss of the grandfather and dear friend, Joe in the same weekend. Today, we pick up the story of loss and grief with Joe's widow, Paula. Paula takes us through the experience of losing her husband, wrestling with grief and navigating the unknown. This is the first of a two part story about loss and grief. Mary introduces us to a weekend where she lost two loved ones unexpectedly. She shares how the shock and heartache threatened to overwhelm her. We ask hard, unanswerable questions about how to put one foot in front of the other in wake of traumatic loss. On this episode, Jess and Mary wrap up the Enneagram series by discussing resources for next steps and more learning. They share Enneagram books, podcasts, social media, websites, artists, conferences, and more. If you want to know more about the Enneagram and don't know where to start, this episode is for you. In this episode, Jess and Mary continue their discussing of the Enneagram and what they have learned through the book club selection, The Road Back to You. They're diving into their individual numbers and how those numbers apply to friendships, families, careers, and romantic relationships.